MB-300/MB-400 Getting Started - NexSens Technology Inc.
NexSens data buoys should be fully constructed onshore prior to deployment. 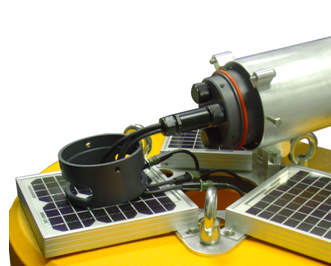 Common accessories such as the tower, solar panels and additional ballast weight require user assembly. Secure the buoy in an upright position. 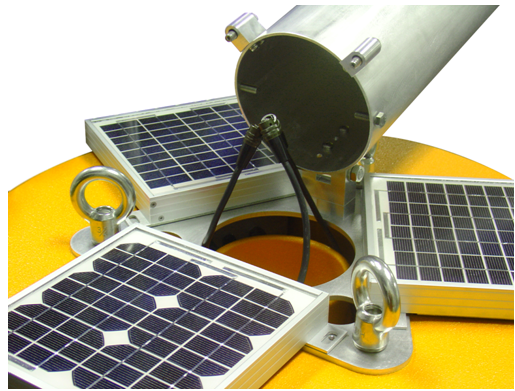 Keep the top of the buoy open and free for mounting accessories. Mount the buoy tower using the supplied 1/2” hardware (screw, lock washer, and nut) as shown. Tighten until the lock washer is flat. Avoid over-tightening. 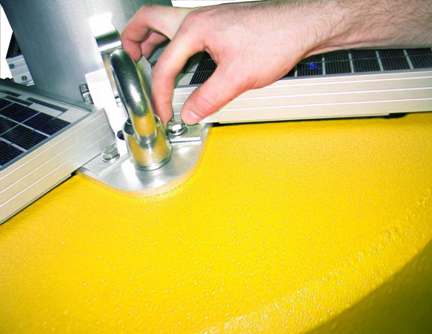 Over-tightening the hinge bolt could result in deformation of the hinge base, making it difficult to open and close the buoy tower. The tower is now hinged. 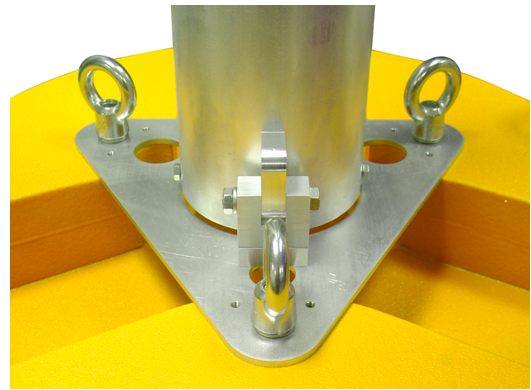 When vertical, the tie-down bolts align with threaded holes on the buoy top plate. 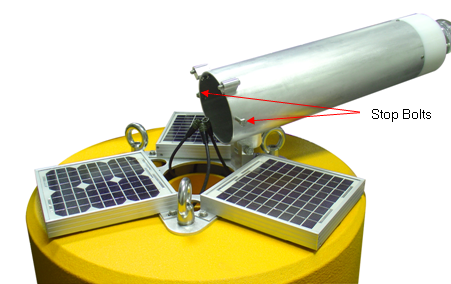 There are three cut-outs in the buoy for the solar packs. Insert each solar pack into a cut-out. Position the output power cords (MS4 pin connector) over the center buoy well (as shown). These will be connected later to the harness that supplies power to the SDL500 data logger. 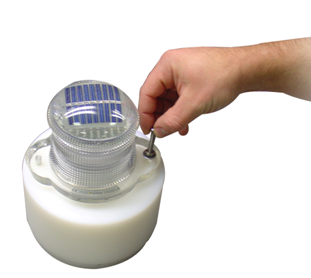 Use the supplied screws (5/16”-18 x 1/2”), washers, and lock washers to secure the solar packs to the top of the buoy. Be sure to tighten until the lock washers are flat. Loosen the tie-down bolts and confirm that the buoy tower opens and closes without hitting the solar panel. 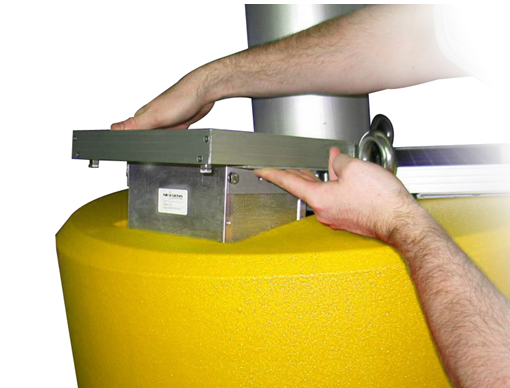 The top lid of the buoy tower includes the hardware necessary for mounting a beacon. 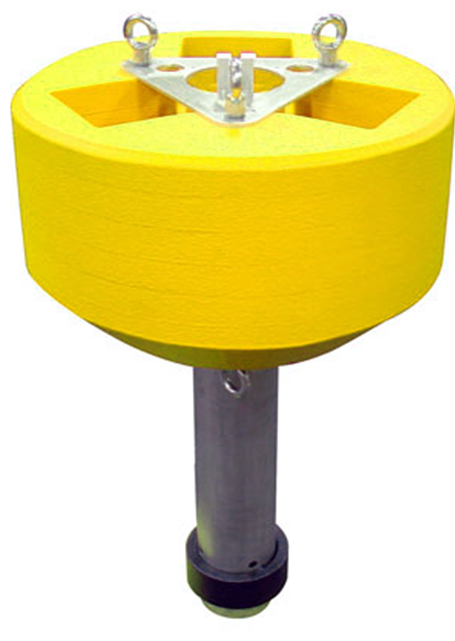 Remove the screws, and position the beacon as shown. Use the supplied screws (1/4”-20 x 1 1/4”), lock washers, and washers to secure the beacon in place. Do not over-tighten the beacon mounting screws. The beacon deforms easily under screw loading. 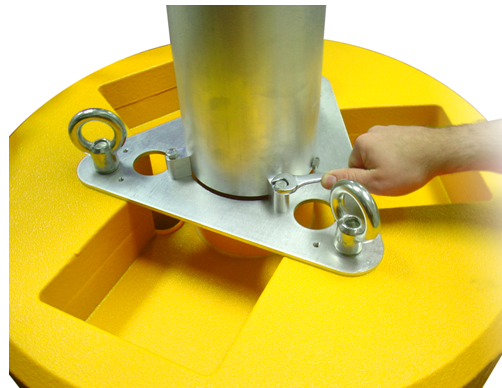 Use the supplied screws (1/4”-20 x 3/8”) to mount the buoy lid with beacon to the top of the tower. Prior to deployment, it is essential to test the monitoring system (sensors, data logger and telemetry) onshore. This will allow users to familiarize themselves with the system and confirm proper operation. Open the tower to the horizontal position and remove the two stop bolts near the bottom. This will allow the SDL500 to be inserted. Position the SDL500 partially out of the tower and remove the bottom guard. 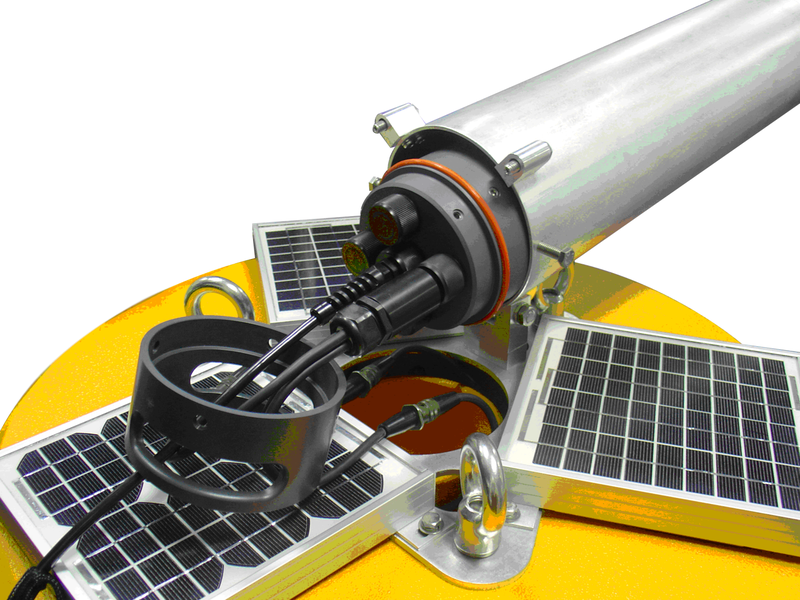 Connect the power harness to port D and attach each of the MS4 connectors to the mating solar pack connectors (now located in the center buoy well). Be sure the guard is installed in-line, as it will be reconnected later. Figure 9: SDL500 positioned slightly out of tower with guard removed and power harness connected to port D.
Connect sensors to the appropriate ports on the SDL500. Refer to the SDL500 operations manual for additional information. Reconnect the guard to the SDL500 data logger. The tower will remain open during this pre-deployment check, so sensor cables can simply hang over the side of the buoy. Launch iChart software and confirm that the SDL500 and sensors are communicating properly. Refer to the appropriate data logger manual and iChart software manual for additional information as required. The pre-deployment check is complete. The buoy, data logger, and sensors can now be prepared for deployment.